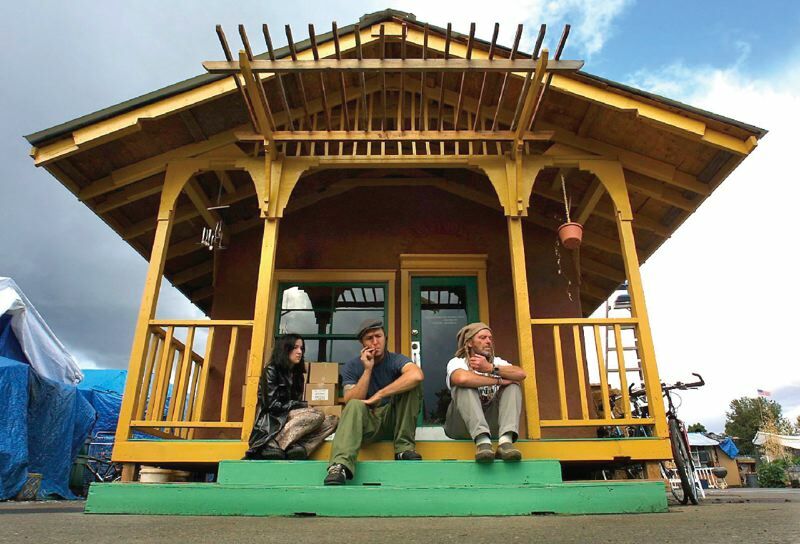 PAMPLIN MEDIA PHOTO: JIM CLARK – Dignity Village founder Jack Tafari (right) sat on the steps of a straw and mud house in 2003 with residents Cat Spry and Lawrence Lyman. On Monday, regional housing officials reported a sharp spike in the number of people living in emergency shelters and transitional housing during the annual “point in time count” conducted in February. Fourteen residents of the Kenton neighborhood hope to be included in next year’s statistic, but not 2019’s. That’s because earlier this month, 14 homeless women moved into new 96-square-foot “sleeping pods” on an acre of city-owned land in North Portland’s Kenton neighborhood. Kenton Women’s Village was heralded as the city’s first community of houseless people to be founded with public backing and an official vote of neighborhood support. But the fledgling local village is heir to a national social protest movement that Portland homeless activists have helped lead for nearly two decades. 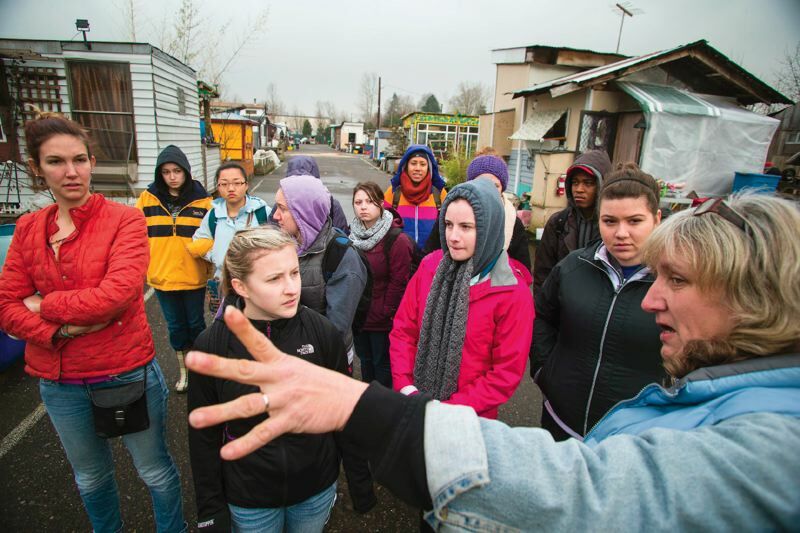 PAMPLIN MEDIA PHOTO: CHRISOPHER ONSTOTT – Lisa Larson, who calls herself the ‘vice chief executive officer’ of Dignity Village gave a group of University of Portland students a tour of the Northeast Portland homeless camp for their urban poverty immersion experience in 2013. Dignity Village, a collection of tiny houses and common structures scraped together with love and elbow grease, turns 17 this year. Located on a city-owned parcel next to the Columbia River Correctional Institution and the city’s Sunderland leaf recycling facility, it appears to be the longest continuously sited community of its kind in the country. Mubarak, Jack Tafari, Tim Brown and JP Cupp were among the group who brought the then-radical settlement to life in December 2000, according to Dignity Village resident Scott Layman and Mubarak. For Mubarak, meeting Tafari, a white Rastafarian who died last year, was a moment that catalyzed his whole life. “I felt like somebody gave me a golden rainbow to go to heaven on,” he says. The four were part of a wave of protests that brought national media attention to houselessness in Portland through events like shopping cart parades: cavalcades of houseless people pushing shopping carts filled with possessions from one settlement site to another. Mubarak says he met Cupp and Brown at a Free Mumia Abu-Jamal protest. The protest movement presented an alternative narrative to a society that tended to view houselessness as criminal, Mubarak says. The group that founded Dignity Village came together in tent clusters known as Camp Dignity, first under bridges in Northwest Portland, later under the Fremont Bridge. The early tent settlements that would lead to Dignity Village had informal rules prohibiting drugs, alcohol and violence, Mubarak says, which created an environment of relative safety that attracted others. As the group grew, its governance structure became more formal; it registered as a 501(c)3 nonprofit in December 2001 and soon split into three parts, one of which relocated to the village’s current site: Sunderland Yard, a city-owned property in an industrial area near Portland International Airport. Though some village members felt the site’s remote location, far from social services, doomed it to failure, the community has persisted. In 2007, the Portland City Council formalized its rent-free relationship with Dignity Village when it adopted Ordinance No. 180959, authorizing a contract with Dignity Village to manage a transitional housing campground at Sunderland Yard for up to 60 people, city documents show. Dignity Village wasn’t the first homeless village in the nation, a distinction that goes back to the “Hoovervilles” of the Great Depression and beyond. But it anchors Portland’s place in a radical history of homeless villages that is still being written. In Seattle, what may be among the first homeless villages in the nation, “Tent City” was founded in 1990 by Share, now part of Share/Wheel — which describes itself as “self-organized, democratic, grassroots organization of homeless and formerly homeless individuals.” The original Tent City no longer exists, but three others, Tent City 3, Tent City 4 and Tent City 5, do. Tent City 3 and 4 move regularly, while Tent City 5 has plans to stay on its site in Seattle’s Interbay neighborhood for two years. A homeless village in a Los Angeles parking lot calling itself “Justiceville” was founded in 1993, and eventually was sanctioned by the City of Los Angeles. Its successor, Dome Village, no longer exists. In Portland, it took more than a decade for a second homeless village to spring up. In 2011, during a wave of downtown Portland protests ignited by the Occupy Wall Street movement in New York, a group of homeless individuals pitched tents on a prominent corner of West Burnside Street next to the Chinatown Gateway. That settlement, Right 2 Dream Too, moved to a parking lot near the Moda Center earlier this month and is recreating itself with a new covered common sleeping area for “overnighters” and 10 new tiny houses. A third group launched Hazelnut Grove, to continuing controversy, in 2015 in North Portland’s Overlook neighborhood. Village residents pitched tents, often in violation of local zoning codes, either with a property owner’s permission (Right 2 Dream Too) or on publicly owned lands (Hazelnut Grove and Dignity Village). The new Kenton Women’s Village, by contrast, is being created by a coalition that includes activists as well as city, county, neighborhood and nonprofit partners. 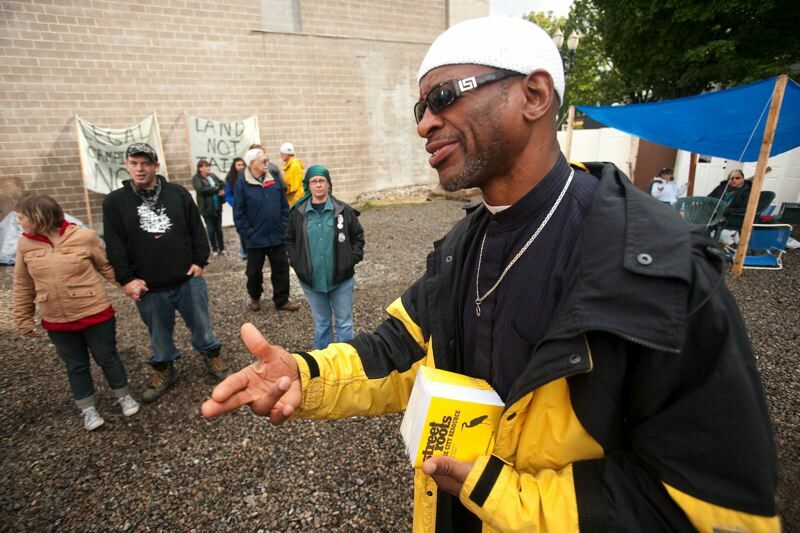 PAMPLIN MEDIA GROUP: CHRISTOPHER ONSTOTT – Homeless advocate Ibrahim Mubarak, one of the founders of Dignity Village in Northeast Portland, helped organize the move in at Right 2 Dream Too in 2001. All four villages, which together house around 160 people, face an uncertain future. Though in 2016 Hazelnut Grove residents replaced their tents with permanent structures — tiny houses, a bath house and a library — board members are in a contentious, city-led mediation process with the Overlook Neighborhood Association. The Kenton village has a one-year lease on its current site; the lease could be extended, though there are plans to build a permanent affordable housing development on the site. (The project, sponsored by Transition Projects, will offer studios and single-room-occupancy units at rents affordable to low-income and very-low-income individuals — people who may be at risk of homelessness.) It’s not yet clear whether the village will relocate or disband if those plans proceed. Right 2 Dream Too has a free two-year lease for its new site on a parking lot owned by the Portland Bureau of Transportation near the Moda Center. But its future is predicated on the city continuing to extend its housing and homeless “state of emergency,” which allows a zoning variance for temporary shelters. At Dignity Village, 17 years after its founding, Katie Mays, a caseworker from nonprofit JOIN, assists residents with finding permanent housing. Its residents remain quasi-independent, maintaining a community of 53 people on just $27,000 total expenditures per year. How long will Dignity Village be there? “I don’t know,” Mays says, with a sigh. The question, for her, stirs long-held dreams. The movement continues to expand. Architect Mark Lakeman, who worked with Dignity Village in its early days as co-founder of the City Repair Project, says the village concept is becoming a Portland export. Lakeman’s architecture and planning firm Communitecture is working with San Jose, California, to create a series of 10 homeless villages there, and with Clackamas County to create a homeless village specifically for veterans. Hope Village is being constructed in Medford, a permanent village named Emerald Village is going up in Eugene, and others are being built as far afield as Scotland and Australia. Lakeman sees the new Kenton village as the heir to a line that stretches back to Dignity Village. 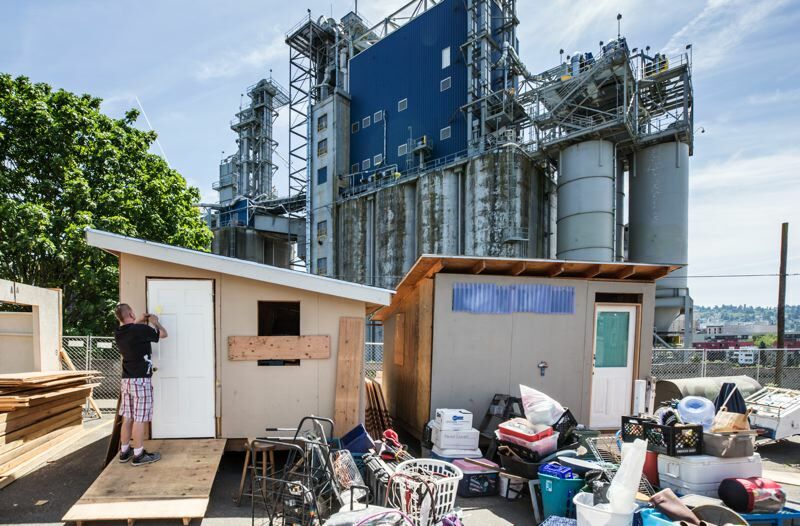 PAMPLIN MEDIA GROUP: JONATHAN HOUSE – The Right 2 Deam Too homeless camp has relocated to a parking lot in the Rose Quarter, where it now inlcudes 10 tiny homes built by Benson High School students. Homeless villages aren’t monolithic. In fact, Portland alone has four distinct models. Dignity Village (53 residents/established 2000) is a 501(c)3 registered nonprofit organization with a city contract that includes rent-free space. Right 2 Dream Too (75 residents/2011) is described by board members as a “rest area.” The encampment provides a covered outdoor space for “overnighters” to rest in any time of day or night. Launched without government approval, it is relocating with the help of the city. Hazelnut Grove (20 residents/2015) has improved its physical infrastructure while working to overcome what Lakeman called “hostility” from the neighborhood and indifference from city officials. It now features a tiny new library and a bunkhouse that appears to borrow a page from Right 2 Dream Too’s common area. Kenton Women’s Village (14 residents/2017) opened with the blessing of the city and the neighborhood and is the only village that does background checks on its residents. It’s also the only village operated in close coordination with an established social services agency, with five case managers and other paid staff. But the four villages share many things in common, including what David Bikman, steering committee chair of village advocacy group the Village Coalition, calls a “small is beautiful” approach. Bikman contrasts villages with the widely-considered proposal for a mega-shelter put forth last year by developer Homer Williams. Ultimately rejected, the service-enhanced shelter at Terminal 1 in NW Portland could have held 1,500. What does a village need? Vahid Brown, housing policy coordinator for Clackamas County and Village Coalition steering committee member, says its components are a governance structure, basic personal hygiene facilities, and maintenance and garbage service. Individual living quarters in all four villages typically have no running water and no wired electricity. All have common bathrooms or portable toilets, shared water reserves for drinking and kitchen areas. A few have heat, but many don’t. Some, like Kenton’s, use “passive design” principles and body heat to stay cozy in cold weather. Water is frequently an issue for the four unplumbed villages. Ironically enough, that includes Hazelnut Grove, which sits above an aquifer and water mains. Residents bring in water in 5-gallon jugs, Brown says, and take solar-heated showers. All of Portland’s villages are inclusive places where couples, people with animals, people who identify as gay or transgender, and people with disabilities live. (A 2010 report indicated, however, that Dignity Village was highly disproportionately white compared to Portland’s homeless population.) Margi Dechenne, the housing transitions program manager for Catholic Charities, says four of the Kenton village’s 14 women are women of color: one is black, three are Native American. With R2DToo’s early June move, three of four local homeless villages are in North Portland, with Dignity Village in industrial Northeast. Will Southeast, Southwest or East Portland be next? Village Coalition representatives say the group is talking to leaders of the faith community, and may soon announce new partnerships in other areas of town. This story was first published by the Portland Tribune, part of Pamplin Media Group. It is part of Giving Ground, an investigative series produced by the Open: Housing Journalism Collaborative, a joint project of Open: Housing, Pamplin Media Group and KGW. Look for other stories in this and related series at OpenHousing.net.